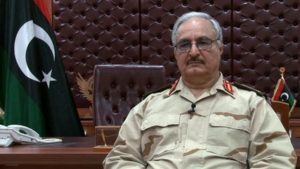 Gen. Khalifa Haftar’s Libyan National Army (LNA) turned back an attack by a rival faction on some of Libya’s major oil ports on Dec. 7. A spokesman for the LNA said rival fighters had withdrawn after briefly occupying the town of Ben Jawad, 30 kilometers (19 miles) west of the port of Es Sider, and were being pursued in the surrounding area, Reuters reported. Four LNA troops were killed and seven wounded in the clashes, a medical source in nearby Ras Lanuf said. Haftar’s forces responded to the attack by the rival faction with airstrikes and reported capturing some of the rival group’s commanders. A security official said the groups that advanced towards the ports in Libya’s oil crescent were linked to the Benghazi Defense Brigades, which tried this year to launch a counter-attack against the LNA. The National Oil Corporation (NOC) said it had not suspended any loadings, but was monitoring the situation carefully. The LNA in September seized control of four oil crescent ports, allowing the NOC to end blockades at three of the ports and double national oil production to about 600,000 barrels per day. Meanwhile, Libyan forces, led by brigades from the western city of Misrata, on Dec. 7 completed a near seven-month battle to oust Islamic State of Iraq and Levant (ISIL) from its stronghold in Sirte. The forces gained full control over a final patch of ground in Sirte’s Ghiza Bahriya district after hours of clashes. Libyan and Western officials say some ISIL jihadists escaped from Sirte before the battle or in its early stages. They fear an insurgent campaign from outside the city and there have been attacks in outlying areas. Almost all of Sirte’s estimated population of 80,000 fled the city since ISIL took control in early 2016. Libyan officials asked local families not to return to Sirte until mines had been cleared.